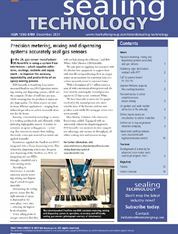 From its international perspective, Sealing Technology distils the information you need to take advantage of every new development and business opportunity in the pump and fluid handling industry. It quickly alerts you to rapid changes and developments, and analyses their impact on the industry and its marketplace. • Technology news - all the latest developments including dynamic and static seals, the latest seal designs to reduce fugitive emission, centrifugal pump and mechanical seals, compressed gasket sheet materials, etc. • Business news - key information on your competitors' movements in the market, joint ventures, mergers and acquisitions worldwide, major contracts, financial information relating to the major players, etc. Sealing Technology covers the following areas: automotive, biotechnology, Brewing and wine, chemicals, desalination, drinking water treatment, electronics, food and beverage, mineral extraction, oil and gas, pharmaceuticals, power generation, pulp and paper, and sewage treatment.